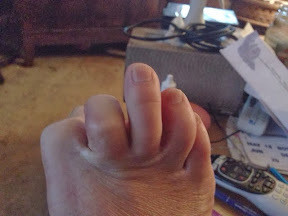 I can flip "The Bird" with my right foot. Not so with the left. Seriously, I thought perhaps that I had seen everything. Mere mortals cannot do this thing. Aren't you the special guy! With all due respect sir I have been looking at your magic toes for quite some time now. I guess that is enough.